Yizhou Zou, M.D., Peter Stastny, M.D., Caner Susal, M.D., Bernd Dohler, Ph.D., and Gerhard Opelz, M.D. 1. Bahram S, Bresnahan M, Geraghty DE, Spies T, A second lineage of mammalian major histocompatibility complex class I genes. Proc Natl Acad Sci U S A 1994; 91: 6259-63. 2. Jinsushi M, Takehara T, Kanto T, et al. Critical role of MHC class I-related chain A and B expression on IEN-alpha-stimulated dendritic cells activeation: impairment in chronic hepatitis C virus infection. J Immunol 2003; 170: 1249-56. 3. Menier C, Riteau B, Carosella ED, Rouas-Freiss N. MICA triggering signal for NK cell tumor lysis is counteracted by HLA-G-mediated inhibitory signal, Int J Cancer 2002; 100: 63-70. 4. Tieng V, Le Bouguenec C, du Merle L, et al. Binding of Escherichia coli adhesin AfaE to CD55 triggers cell-suface expression of the MHC class I-related molecular MICA. Proc Natl Acad Sci U S A 2002; 99: 2977-82. 5. Zwirner NW, Marcos CY, Mirbaha F, Zou Y, Stasstny P, Identification of MICA as a new polymorphic alloantigen recognized by antibodies in sera of organ transplant recipients. Hum Immunol 2000; 61: 917-24. 6. Cardarelli F, Pascual M, Tolkoff-Rubin N, et al. 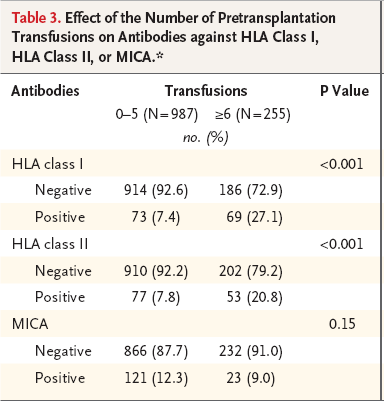 Prevalence and significance of anti-HLA and donor-specific antibodies long-term after renal transplantation. Transpl Int 2005; 18: 532-40. 7. Kristersen T, Grunnet N, Madsen M, et. Al. Hyperacute rejection of kidney allograft may be caused by cytotoxic lymphocytes. Acta Pathol Microbiol Scand[C]1976; 84: 304-12. 8. Patel R, Terasaki PI. Significance of the positive crossmatch test in kidney transplantation. N Eng J Med 1969; 280: 735-9. 9. Jeannet M, Pinn VW, Flax MH, Winn HJ, Russell PS, Humoral antibodies in renal allotransplantation in man, N Eng J Med 1970; 282: 111-7. 10. Trpkov. K, Campbell P, Pazderka F, Cockfield S, Solez K, Halloran PF, Pathologic features of acute renal allograft rejection associated with donor-specific antibody: analysis using the Banff grading schema. Transplantation 1996; 61: 1586-92. 11. Lee PC, Terasaki PI, Takemoto SK, et al. All chronic rejection failures of kidney transplants were preceded by the development of HLA antibodies. Transplantation 2002; 74: 1192-4. 12. Zwirner NW, Dole K, Stastny P, Differential surface expression of MICA by endothelial cells, fibroblasts, keratinocytes, and monocytes. Hum Immunol 1999; 60: 323-30. 13. Zou Y, Mirbaha F, Lazaro A, Zhang Y, Lavingia B, Stastny P. MICA is a target for complement-dependent cytotoxicity with mouse monoclonal antibodies and human alloantibodies. Hum Immunol 2002; 63: 30-9. 14. Sumitran-Holgresson S, Wilczek HE, Holgresson J, Soderstrom K. Identification of the noclassical HLA molecules, MICA, as targets for humoral immunity associated with irreversible rejection of kidney allografts. Transplantation 2002; 74: 268-77. 15. Mizutani K, Terasaki PI, Bignon JD, et. al. 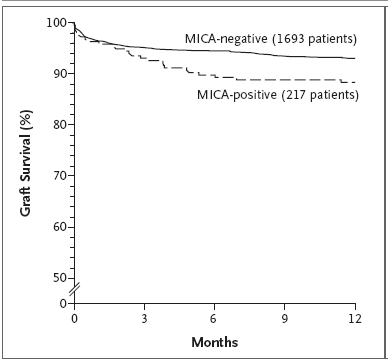 Association of kidney transplant failure and antibodies against MICA. Hum. Immunol 2006; 67: 683-91. 16. Mizutani K, Terasaki PI, Rosen A, et al. 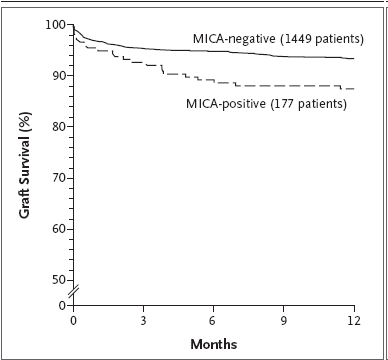 Serial ten-year follow-up of HLA and MICA antibodiy production prior to kidney graft failure. Am J Transplant 2005; 5: 2265-72. 17. 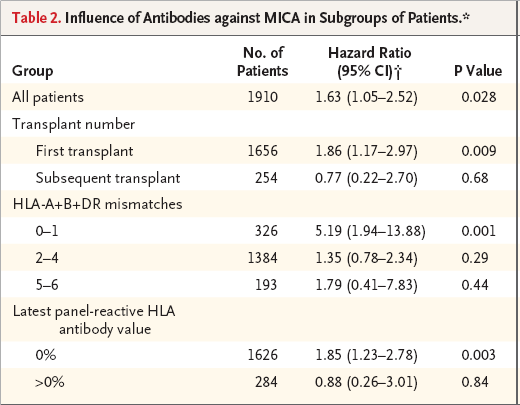 Mizutani K, Terasaki PI, Shih RN, Pei R, Ozawa M, Lee J. Fequency of MIC antibody in rejected renal transplant patients without HLA antibody. Hum Immunol 2006; 67: 223-9. 18. Zou Y, Heinemann FM, Grosse-Wilde H, et. al. Detection of anti-MICA antibodies in patients awaiting kidney transplantation, during the post-transplant course, and in eluates from rejected kidney allografts by Luminex flow cytometry. Hum Immunol 2006; 67: 230-7. 19. Kapan EL, Meier P. Nonpartametic estimation from incomplete observations. J Am Stat Assoc 1958; 53: 457-81. 20. Cox DR. Regression models and life-tables. JR Stat Soc [B]1972; 34: 187-220. 21. Hankey KG, Drachenberg CB, Papadimitrious JC, et al. MIC expression in renal and pancreatic allografts. Transplantation 2002; 73: 304-6. 22. Quiroga I, Salio M, Koo DD, et al. Expression of MHC class I-related chain B (MICB) molecules on renal transplant biopsies. Transplantation 2006; 81: 1196-203. 23. Opelz G, Non-HLA transplantation immunity revealed by lymphocytotoxic antibodies. Lancet 2005; 365: 1570-6. 24. Moraes JR, Stastny P, Allo-antibodies to endothelial cell antigens. In: Kissmeyer-Nielsen F, ed. VI international Hiscompatibility Workshop and Conference; 1975 June 29-July 5; ArhusDenmark. Copenhagen: Munksgaard, 1975; 391-7. 25. Idem. A new antigen system expressed in human endothelial cells. J Clin Invest 1977; 60: 449-54. 26. Vermehren D, Sumitran-Holgresson S. Isolation of precurse enothelial cells from peripheral blood for donor-specific crossmatching before organ transplantation. Transplantaton 2002; 74: 1479-86. 27. Carter V, Schenton BK, Jaques B, et al. 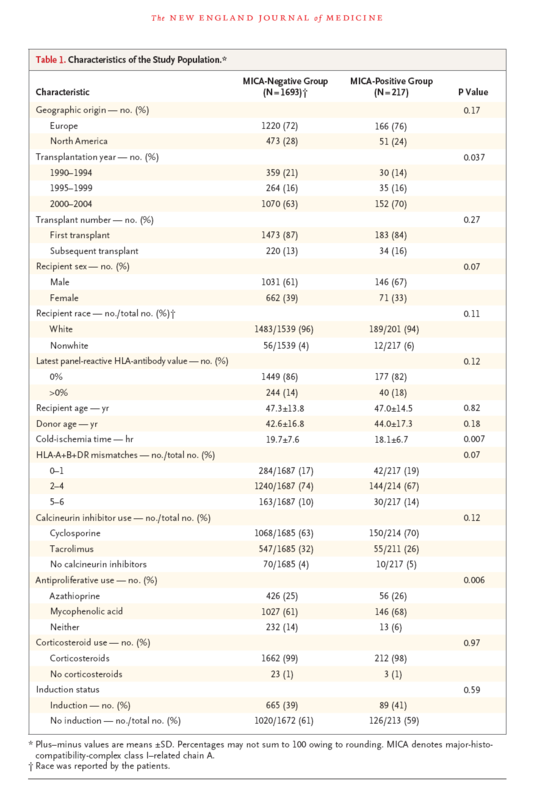 Vimentin antibodies: a non-HLA antibody as a potential risk factor in renal transplantation. Transplant Proc 2005; 37: 654-7. 28. Kekomaki S, Kyllonen R, Salmela K, Koskimies S, Kekomaki R, Platelet-specific alloantigens in cadaveric renal transplantation: a prospective study: effect of HPA5b mismatch in acute vascular rejection of renal allografts. Tissue Antigens 2001; 57:154-7. 29. Tinckam K, Rush D, Hutchinson I, et al. The relative importance of cytokine gene polymorphisms in the development of early and late acute rejection and sixmonth renal allograft pathology. Transplantation 2005; 79: 836-41. 30. Abdi R, Tran TB, Sahagun-Ruiz A, et al. Chemokine receptor polymorphism and risk of acute rejection in human renal transplantation. J Am Soc Nephrol 2002; 13: 754-8. 31. Dragun D, Mulle DN, Brasen JH, et al. Angiotensin II type 1-receptor activating antibodies in renal-allograft rejection. N Eng J Med 2005; 352: 558-69. 32. Zhang Y, Stastny P, MICA antigens stimulate T cell proliferation and cellmediate cytotoxicity. Hum Immunol 2006; 67: 215-22.